The product of two translations, Rafaël Rozendaal’s six tapestries materially fix the Internet’s fleeting forms into pulsing, vibrant abstractions. 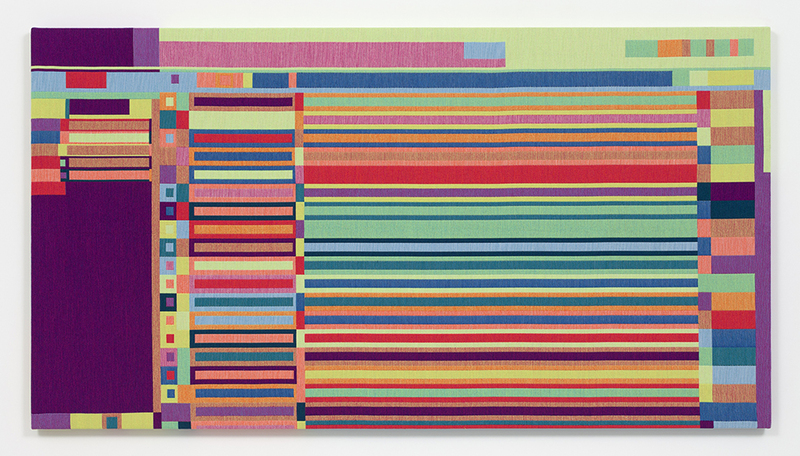 In 15 05 02 Gmail (all works 2015), for instance, the myriad cells and boxes of the familiar inbox architecture become a bold spectrum of solid-color rectangles rendered as a stunning Jacquard weaving. Twitter, Instagram, and Pinterest are also beautifully obscured until they become largely unrecognizable in the final works. Threaded looms, now notably powered by computers, warm up the cold interfaces of the Internet and spin them into comforting blankets for the eye in works such as 15 05 05 Twitter. Rozendaal’s pieces suggest a conflicted modernist hybrid of painting and tapestry—its historically intertwined relative—echoing works by Anni Albers such as Wall Hanging, 1925, or South of the Border, 1958. Wrapped around rectangular stretcher bars, these pieces quite obviously mimic Rosemarie Trockel’s or Alighiero Boetti’s gestures toward painting. They likewise recall one of painting’s historical functions as the first draft for a more coveted tapestry of the same image. The punch cards that drove nineteenth-century Jacquard looms are arguably a precursor to our laptops’ operating systems. As such, Rozendaal’s weavings return the imagery of our digital world to its distant cousin at the other end of modern mass manufacturing.